Finding the right mattress can be a tedious and time-consuming process, especially if you plan on sharing your bed with a partner and you don’t know what would work well for both of you. If you need something that can suit both your needs and the needs of your partner, perhaps you should consider buying one of the all foam mattresses such as Lull and Leesa. Both come in at an affordable price, and both are designed to appeal to a wide range of sleepers. So regardless of what you and your partner prefer, whether you are side, back or stomach sleepers, both of these mattresses will work perfectly for you. The Lull is a 10-inch universal comfort type memory foam mattress, designed to appeal to a wide range of sleepers, and it is composed of 3 layers of foam. A 1.5″ Top layer – The top layer is made of gel infused memory foam designed to provide cooling and comfort for the sleeper. A 1.5″ Middle layer – This layer is made up of conventional memory foam designed to support the body and provide even weight distribution and spinal alignment. A 7″ Bottom layer – This layer is made of dense support foam. It serves as the foundation for the mattress and works well with the top layers to provide a supportive sleeping surface. The Lull has an extremely soft cover made of 90% polyester and 10% rayon. It provides breathability to the mattress and aids in cooling. The Lull is a medium soft mattress coming in around a 5/6 out of 10 on the firmness scale (10 being firmness). But as we always tend to mention, firmness is largely weight dependent, and for me, this mattress was firmer than it was for my boyfriend Andrew. He is 230 lbs, and he compressed the top layers more than I did. The Lull provides a pretty good support, and its combination of foam layers distributes body weight evenly across the mattress. It isn’t too firm to cause pressure point pain, or too soft not to provide the support needed to sleep comfortably. It is, therefore, suitable for all sleeping positions. The Lull mattress is a comfortable one, allowing a cool and comfortable night’s sleep. The foam within its layers offers enough give to mold to your body without causing you to feel enveloped by the mattress. There is a good amount of bounce coming from the gel-infused memory foam layer which perfectly adapts to changes in sleep position as well. The softness of the cover combined with the initial soft response from the memory foam layers really places this mattress among the most comfortable ones we have tried out to date. The layer of gel-infused memory foam and soft breathable cover work together to prevent the build-up of heat and the feeling of stickiness usually present in many memory foam mattresses. They work together to create a cool and comfortable sleep surface and provide you with a restful and quality sleep. As it has been already mentioned, sinkage is largely weight dependent and Andrew, being significantly heavier than me, sunk into the mattress more than I did. However, he did not sink down to the foundation, and I did not experience the feeling of sinking into a hole or rolling towards Andrew. Edge support with this mattress is solid and prevented us from rolling off the sides. There was a decent amount of motion transfer with this mattress when Andrew adjusted positions during the night which, again, is to be expected due to our weight disparity. There was a small degree of smell when we opened and unpacked the Lull mattress, but it was nothing overpowering and dissipated within a few hours. This is to be expected due to its all foam nature and the fact that it is shipped compressed in a box. The Lull is reasonably priced, coming in at $800 for a Queen. This is an excellent price given the quality materials used its construction. Click here to read the full Lull mattress review. 2″ Top Cooling layer – The top layer is made of 2″ of cooling Avena foam, designed to provide cooling and bounce. 2″ Middle layer – This layer is designed to provide support to the body and pressure relief, and it is made up of 2″ of contouring memory foam. 6″ Bottom layer – This layer is made of 6″ of dense support foam and it provides the foundation for the mattress and works with the top layers to create support. The Leesa has an extremely soft cover woven from one piece of polyester-Lycra blend fabric that works to provide a cool surface and comfort as well. The Leesa, just like the Lull, comes in only one firmness option designed to appeal to a wide range of sleepers, and it is around a 5/6 out of 10 on the firmness scale, with 10 being the firmest. I tended to compress the top layers of he Leesa mattress less than Andrew who weights considerably more than I do. Therefore, Andrew did not feel that the Leesa provided much support to him when sleeping, as his heavier weight caused him to compress through the upper layers quite a bit. The thinner construction of this mattress also caused him to bottom out when sitting up on it which was not the case with the Lull. While the Leesa has a soft and comfortable exterior and the Avena foam in the top cooling layer provides a bit of responsiveness and bounce, it does not provide enough support and comfort like some other all-foam mattresses we have tried out to date. Andrew felt it was not supportive enough for his heavy weight, and it caused him to reach the foundation of our bed. This, if you are a heavier sleeper as well, may reduce the overall comfort and affect the quality of your sleep. As for sleeping hot, the Leesa does a good job here, and it is about average in this category. Its thin cover and the use of the Avena foam layer in its construction provides good air flow, makes this mattress breathable, and eliminates the feeling of stickiness usually present in memory foam mattresses. As it has been already said, sinkage and motion transfer is highly dependent on sleeper’s weight and as Andrew weights around 230 lbs, he pressed through the 10″ Leesa top layers immediately upon sitting and lying on the mattress. The sinkage of the Leesa also caused motion transfer during the night as Andrew would sink lower than me, which caused me to roll into him. Edge support in this mattress is minimal and Andrew’s weight compressed the bed. Lying flat seemed to disperse his weight, but at times when rolling over in the night, he would feel the harder support layer through the compressed thinner comfort layer. There is a small degree of off-gassing/smell upon opening the box. 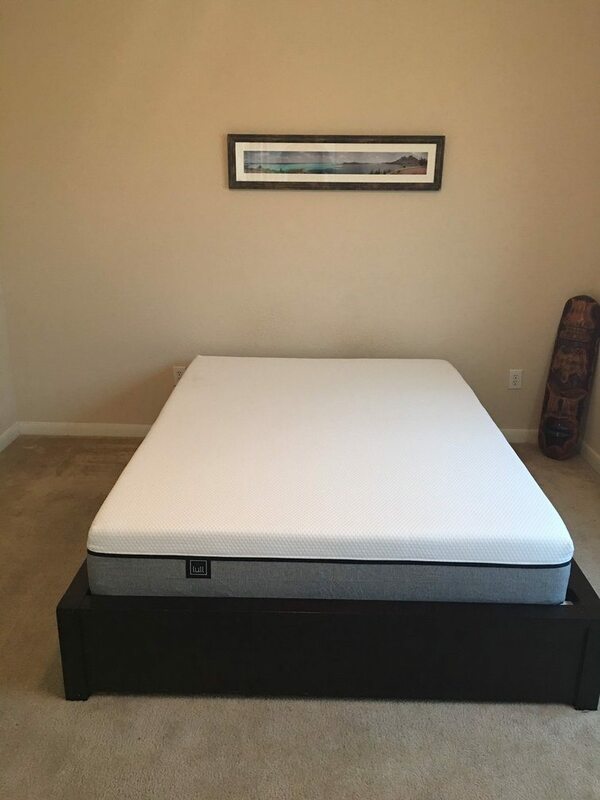 This is due to the all-foam construction of this mattress, but it is nothing overpowering when compared to some other mattresses we have reviewed. Leesa is pretty reasonably priced when compared to the in-store brands, and it comes in at $890 for a queen. You can save $100 on this mattress by using the link given above. Click here to read the full Leesa mattress review. Below is our comprehensive side-by-side comparison of the Lull vs. Leesa mattress. A medium firm feel – The Lull mattress comes in at a universal firmness option which scores 5/6 out of 10 on the firmness scale (10 being the firmest). It isn’t too firm to cause pressure point pain, or too soft not to provide the support needed to sleep comfortably. A mattress that sleeps cool – A 1.5″ of gel-infused memory foam in the top comfort layer of this mattress does a good job of preventing the build-up of heat and the feeling of stickiness usually present in memory foam mattresses. A soft and breathable cover aids in cooling and helps create a pleasant sleep surface. A supportive mattress – The combination of different foam layers in the construction of the Lull helps distribute body weight evenly across the mattress and provides an excellent support for all sleeping positions. Memory foam feel – The softness of the Leesa cover combined with the initial soft response from its memory foam layers provide a soft feel typical for memory foam. Sleeping cool – The thin cover of this mattress and the use of the Avena foam layer in its construction allow easier air flow, make this mattress breathable, and eliminate the feeling of stickiness usually present in memory foam mattresses.